Urethral duplication is a rare congenital anomaly occurring exclusively in males. We describe a case of Type IIA1 urethral duplication that was treated successfully by an end-to-side dorsal-to-ventral urethro-urethrostomy. A 12-year-old boy presented with poor flow of urine and recurrent urinary tract infections (UTIs) for 5 years. He had undergone a hypospadias repair at the age of 3 years elsewhere. On examination, his growth was normal with no dysmorphic features. Two external meati were noted - one at the tip of the glans and the other at the corona dorsally. 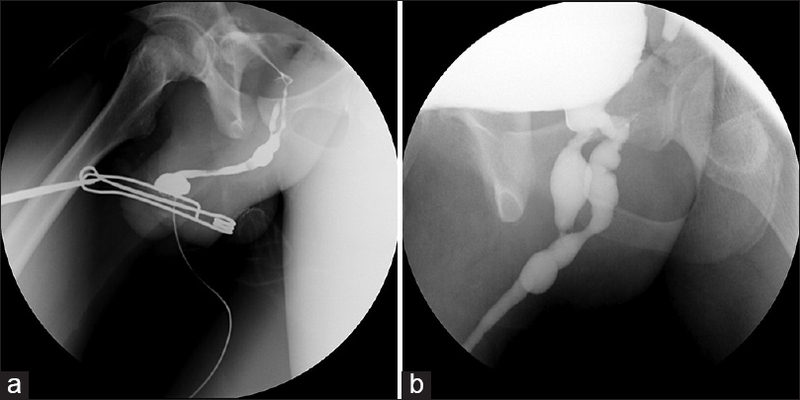 A voiding cytourethrogram (VCUG) [Figure 1] revealed complete urethral duplication with pan-anterior narrowing of the hypoplastic dorsal urethra (red arrowhead) along with areas of mucosal irregularity. Evidence of ventral urethral reconstruction with a prepucial tube with a small diverticulum was noted (red arrow). The bladder neck appeared duplicated, and the ventral bladder neck appeared hypoplastic and compressed by the dorsal bladder neck during voiding (yellow arrow). Cystourethroscopy revealed a stenosed dorsal urethra to about 5F from 5 cm proximal to the meatus. The ventral urethra was patent with a skin tube extending till the proximal penile region admitting a 14 Fr cystourethroscope freely. The veru was seen in the ventral urethra. Since the ventral urethra was found to be a patent on urethroscopy, a possibility of functional obstruction of the ventral urethra by the occluded dorsal urethra was suspected. Hence, an end-to-side dorsal-to-ventral urethro-urethrostomy was performed via a midline perineal incision. The dilated posterior part of the dorsal urethra was disconnected from its hypoplastic anterior part and anastomosed end-to-side to the ventral urethra. We confined ourselves to the mid bulbar region, and extensive proximal dissection was not necessary thereby avoiding the region of the sphincter. In addition, placing a zebra guide wire and a 4Fr ureteric catheter through the dorsal and ventral urethra respectively helped easy identification. We felt that attempting excision of the hypoplastic dorsal urethra in the penile region could potentially damage the previously repaired ventral skin tube and was unnecessary. He made an uneventful recovery and was free from UTI with an excellent flow (Qmax 22 ml/s, voided volume 489 ml, Residue 50 ml) at 1-year follow-up. The postoperative VCUG showed a patent anastomosis [Figure 2]. Our patient had already undergone urethroplasty of the ventral hypospadiac urethra using penile skin, and the lumen of this urethra was adequate on cystoscopy. The distal part of the dorsal urethra was hypoplastic, but the proximal part was dilated as seen on the MCU hence an end-to-side dorsal-to-ventral urethro-urethrostomy was performed. Our contention is that the ballooning of the proximal dorsal urethra was causing a functional obstruction of the ventral urethra during voiding. The significant improvement in flow after diverting the dilated dorsal urethra with no other intervention supports this possibility. Urethral duplication is a rare anomaly and can have a complicated anatomy. A thorough evaluation to determine the exact anatomy and pathophysiology allows the surgeon to individualize the treatment appropriately. Effmann EL, Lebowitz RL, Colodny AH. Duplication of the urethra. Radiology 1976;119:179-85. Salle JL, Sibai H, Rosenstein D, Brzezinski AE, Corcos J. Urethral duplication in the male: Review of 16 cases. J Urol 2000;163:1936-40. Podesta ML, Medel R, Castera R, Ruarte AC. Urethral duplication in children: Surgical treatment and results. J Urol 1998;160:1830-3. Woodhouse CR, Williams DI. Duplications of the lower urinary tract in children. Br J Urol 1979;51:481-7.